You’d think that physicist Stephen Hawking’s favorite place on Earth would be his native England, but it’s actually someplace completely different – as he explains in a new 25-minute documentary from CuriosityStream. 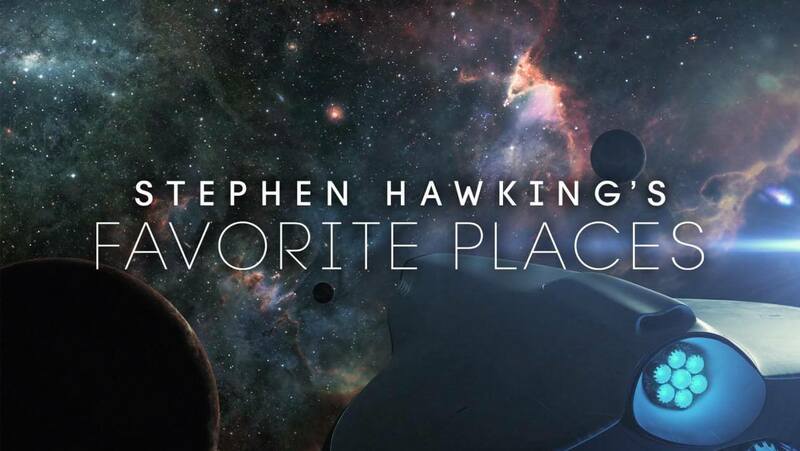 “Stephen Hawking’s Favorite Places” is an exclusive offering from the online video-on-demand channel, founded last year by John Hendricks, who was the mastermind behind the Discovery Channel. It’s the first episode in what’s expected to be a series of original “Favorite Places” features, supplementing CuriosityStream’s library of science documentaries from the BBC and other providers. The real-life Hawking has to use a computer-equipped wheelchair to get around nowadays, but CuriosityStream’s documentary uses CGI magic to put the good doctor into the cockpit of the S.S. Hawking, a spaceship he designed himself. From that vantage point, Hawking takes viewers on a tour through time and space – and talks about his own journey through life as well. The Big Bang: The S.S. Hawking starts its trip with a visit to the beginning of the universe, giving Hawking the opportunity to explain that the Big Bang wasn’t as big of a bang as people think. “There are no fireworks,” he says. “Light won’t exist for hundreds of thousands of years.” But Hawking spins the time dial fast enough to get to a satisfying flash, 380,000 years after the beginning. The Milky Way’s central black hole: When Hawking gets to Sagittarius A*, the supermassive black hole at the center of our Milky Way, fans of the movie “Interstellar” will recognize the scene. It’s a bigger version of Gargantua, the huge black hole in the movie that’s based on calculations by one of Hawking’s pals, Caltech physicist Kip Thorne. To CuriosityStream’s credit, the scene neatly explains the mechanism behind a black hole’s “Hawking radiation” and why Hawking changed his thinking on black hole behavior. Saturn: Hawking’s in love with the giant planet’s rings and its more than 60 moons. “I have no doubt in the future it will be a massive tourist hot spot, complete with hot-dog stands and screaming children,” he says. The S.S. Hawking spends a few extra moments zooming past Enceladus, an ice-covered moon that spews geysers of water vapor and may well harbor life in its hidden ocean. CuriosityStream works on an ad-free subscription model, with a month’s free trial. Standard-definitiion access is $2.99 a month, HD is $5.99 a month, 4K Ultra HD is $11.99 a month. More than 1,500 titles are available. For more information about the service, check out the website.